I taught my class to an eager group of students taking an elective course on Digital Media Literacy. It seems fitting to use Thurgood Marshall Academy for this particular Ed4Good program. The schools mission is to prepare students to succceed in college and to actively engage in our democratic society. They serve 390 students in grades 9-12K and you may have seen the school featured on the CBS Evening News with Katie Couric in a piece that highlighted their 100% acceptance rate for graduates from school. As the DC coach for Ed4Good, it was my job to not only teach a social media class but to also help the students develop a strategy to raise awareness for a cause of their choosing. After much deliberation, the students decided we would put our social media efforts behind a campaign against animal cruelty called “UnFURgivable” as in “it’s unFURgivable to be cruel to animals”. Our goal is to have the students and their supporters do enough Tweets, blog posts and Facebook comments to trend across the social web on March 10, 2011. We’ll be working hard to make a difference over the next 48 hours. Then, on Thursday, March 10, just one day before the start of SXSW, Dell will use their new Social Media Listening Command Center to aggregate and monitor all of our community Internet efforts across the country. Dell will use its social media monitoring and measurement tools to identify the best local effort by the nationwide teams and reward the school with the most traction on the web up to $10,000 dollars in prizes. Please help our cause by following @unFURgvble on Twitter. Then, on Thursday, March 10, 2011 please RT @unFURgvble as often as possible using the hashtags #WDC and #ed4good to identify our Washington, DC Education for Good efforts. Please tell as many people as you can about the unFurgivable efforts within your social networks (e.g. Facebook, Twitter, blogs, etc.). Students using social media to do good in their community. A fun social experiment allowing social media folks to play, teach, learn, do good and give back to our community. Supporting social efforts that interested you. 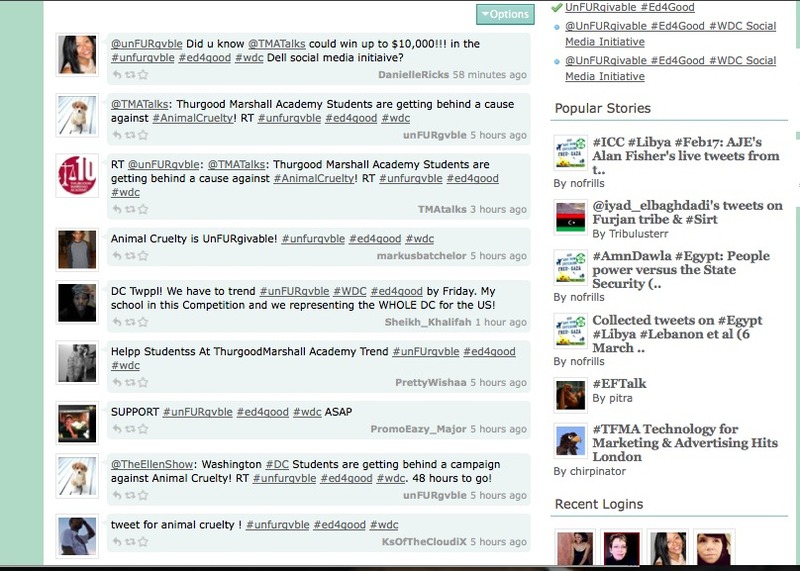 Knowing you helped students gain bragging rights that they create a trend across the social web.